Below the massive, snow covered Alaskan mountains sit quiet seaside towns where fishermen head out to sea to catch fish and to earn paychecks. The hustle and bustle of the docks and smell of the billion dollar fishing industry are alluring, especially for people looking for work in this lucrative business. Canneries process several types of fish, but mostly pink and sockeye salmon. Most Alaskan canneries are located near the docks and piers where fishing boats and tender boats unload and sell their latest catch to the cannery. Then hard working cannery workers decked out in rain slickers process the fish. These hard workers log long days during peak season. Sixteen hour days are not uncommon, but even with a modest base wage, the overtime means you can make $1,100+ per week during peak season. During the peak seasons salmon canneries often operate 24 hours a day, 7 days a week. Overtime pay is paid for any hours worked over eight hours in a day or 40 hours in a week. Overtime is paid at time and a half. So if your base pay is $10/hr. then you would be paid $15/hr. for your overtime hours. A sixteen hour work day at this pay rate would gross a worker $200 for the day. Most workers find the job to be cold, wet, and monotonous, but the paychecks tend to be fat. Finding a job in a salmon cannery isn’t as challenging as other Alaskan fishing industry jobs. Working in a cannery requires little to no training and it’s a great way to get to Alaska and get your feet wet in this exciting industry. Many people enjoy the rhythmic powerful, pounding, clanking machinery of a cannery and there are lots of different jobs to be had. The canning process consists of the iron chink machine, working the slime table, feeding the feeder machine, managing the patching table, loading the retort cookers, sorting the sealed cans, and preparing pallets for shipment. It’s a process that has been going on for ages and is one that continues to employ hard workers. Working long hours in an Alaska salmon cannery may require lots of coffee. It will also form new friendships with people from all over the world. Not to mention you get to live and play in some of Alaska’s coolest and most successful coastal towns. You may not always enjoy the work, but you’ll learn to grin and bear it – especially when the money starts rolling in. 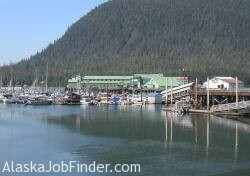 Working in a cannery in Alaska is a great way to get started in the Alaska fishing industry. These are also great jobs for college students as most of the work in done during the summer months. 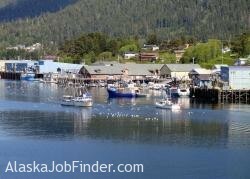 In the Members Section of AlaskaJobFinder we provide you some proven tips and strategies for getting cannery jobs in Alaska and also strategies for how to "follow the fish" to help maximize your earnings for the summer. We also have detailed hiring information for each of the Alaska cannery companies. Are you ready to try your hand at the art of canning fish? Start Your Alaska Job Search Today! There are hundreds of open jobs right now. Simply click the button below to start your job search.